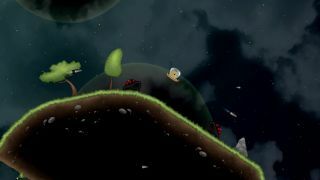 The "gravity-shifting" action-platformer Airscape: The Fall of Gravity has a respectable Metacritic score of 73, and an 87 percent positive user rating on Steam. It's won a few awards, and it's appeared in the Indie Megabooth three times, too. And you've probably never heard of it. In a very interesting, and rather depressing, post-mortem on Gamasutra, creator Daniel West digs into the reasons that the game, despite the positive reaction, was "a total commercial failure." "I've actually never heard of a game released on Steam (with some level of marketing) that has sold less copies than Airscape," West wrote. "Currently, the exact figure sits just shy of 150 copies sold across all distribution platforms. Even conservatively estimating 10% of lifetime sales at launch, we will barely break even on PR costs, never mind development costs. " The reasons for its failure are "complicated," he wrote, although he acknowledged that he doesn't know the whole story himself. He focused on marketing even during the early stages of development, and as the game approached release he hired a professional PR agency to ensure the word got out. Airscape appeared briefly on the front page of Steam when it launched, and had a multi-day run on the front page of the Humble Store. And it's a pretty good game, he said, noting that it's consistently scored in the 70-80 percent range in reviews. It has a high degree of difficulty, but so do games like Super Meat Boy, Hotline Miami, and Nuclear Throne, all of which have been successful. Yet Airscape most definitely was not. The combination of a good game, good marketing, and disastrous sales led West to the conclusion that he and his co-developers "made a game that nobody wanted to buy." "This is a slight exaggeration—I strongly believe that the game has a potential audience of players who would absolutely love it," wrote West. "But, despite our best efforts, the game (or, crucially, what people saw of the game) simply didn’t appeal to the mass market." And because of that, Airscape ended up in what he called "the Death Spiral of marketing": Lack of interest in the gaming press resulted in a lack of interest among gamers, which reinforced disinterest among the press, and so it goes. Distressingly for indie game makers, West said this kind of thing is effectively the norm for 2015, and that even if a developer does everything right, it's still very unlikely that he or she will achieve any kind of real success. He also makes the rather bold statement that Steam, once the arbiter of indie game success, "has long stopped providing much benefit for PC indie games, beyond simply being the expected norm, and amplifying success when it comes." "Game developers can no longer rely on some baseline level of success coming from having a good, well-marketed game on Steam," he wrote. "Like it or not, Steam has become the App Store, sans human curation and with less emphasis on free-to-play. One might look at Steam’s position now as similar to the early phase of the App Store, with a pricing race to the bottom the only way forwards." It's not a happy tale, nor is it entirely unfamiliar: Stories of indie developers struggling to find an audience on Steam and dire warnings about unsustainable pricing seem to be growing increasingly common. Last month, Braid creator Jonathan Blow tweeted, "If you are thinking of quitting your AAA job to go indie, you probably missed the bus by 3-4 years at this point," and earlier this summer the Belgian studio Tale of Tales shut down after more than a decade of operation when its most recent game, Sunset, fell far short of expectations. Indie developer Jeff Vogel, who opined last year that "the indie bubble is popping," addressed the topic as well in a response to West's Gamasutra post, and while he disagreed on some specific points, his takeaway was essentially the same. "Writing games for cash is a harsh, unforgiving affair. Success is rare and failure common, instead of the other way around," Vogel wrote. "If an indie game fails, it shouldn’t surprise you. Success should surprise you." One point that West and Vogel agree on is that the "incredibly low barrier to entry" into game development has led to a huge increase in the number of games released each month, and thus an inevitable decrease in the amount of of money earned per game. Another, more important conclusion they share is that, while the relative tough times are likely to become the new normal, the indie scene will survive. "The indie development scene is incredibly vibrant and I’m absolutely honoured to be a part of it," West wrote. "Indie games will certainly survive. I only hope that the toll on their creators is not too heavy." Catch the whole thing at Gamasutra.